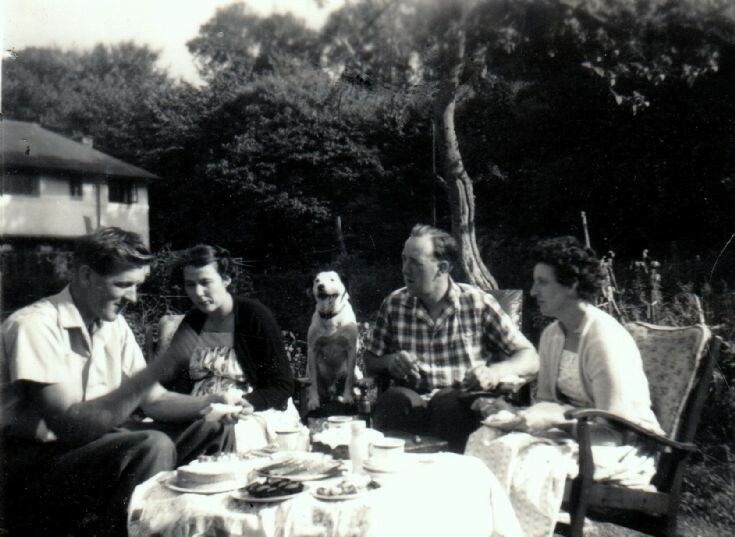 This is a photograph (from left to right) of my Dad, Arthur Shopland, my Mum, Valerie Shopland (née Stoner), Toby the ever present Shopland Dog of the 1950s and, as usual, all Shopland dogs taking centre stage, my Dad’s brother, David Shopland and his wife, Myrtle. The photo was taken at the Gate Lodge, Tilgate Forest Lodge in 1957. Dad and Mum had only just met around this time as Dad was on National Service in Hong Kong in 1956. The romantic in me is thinking they are planning their wedding for 29th March 1958 and Gran had cooked a cake for them to enjoy. Uncle David was best man so was obviously giving advice, and Toby was checking all was OK! In 1958, following their wedding, my parents moved to Slaugham.